Below you'll find some cool Luau Party games ideas for your kids birthday party. If you have not looked at our Luau Party have a look at those ideas too! There you will find lots of party ideas for decorations, invitations, food ideas and much more. Scroll down and check out our cool party games. Lula Polo: Similar to Marco Polo this game is played in a pool. Pick one player to play Lula, he or she must be blindfolded and must find the other players and tag them. Lula must be blindfolded and try to swim and catch the others by calling "Lula" and the rest of the players have to respond at once "Polo!". Lula can call out as many times he/she likes even if Lula is next to a player, the player must respond and Lula can tag him/her. When Lula tags a player that player also becomes a "Lula" and have to be blindfolded and look for other players to tag and make them "Lulas". Limbo Dancing: You and other adults hold up the ends of a stick fairly high off the floor. Let the kids dance under the "limbo", bending backwards. Any one who doesn't manage to get under the limbo is out of the game. Have some Hawaiian music playing in the background. 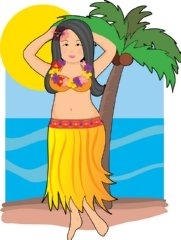 Luau Dance: Before the party learn some Luau dancing steps and the day of the party teach the kids how to Luau dance. Luau Stop: Let the kids dance with music and toss a "magic Luau handkerchief" up in the air, when the handkerchief hits the ground the kids have to freeze, they can’t even move their eyes. The person who moves or makes any noise is out of the game. Then you go again until their is only one player left, the winner. Luau Balloon: Similar to Hot Potato, but played with a balloon filled with water- Luau Balloon. Let the kids stand in a circle. The kid who starts the game has to throw the Luau balloon to a player of her choice, and then close her eyes and turn around, so she can’t know who has the Luau balloon. The players must now toss the Luau balloon around to another player quickly. After a while the person who started the game and who cant see who has the Luau balloon shouts "HOT", the person who is caught holding the Luau balloon is out of the game. And then the game starts again with another child starting to toss the balloon around. The player who is left is the winner. Who In The Water: First set up a long rope between the pool then divide the kids into two groups. Let each team member try to pull the opponents into the water (repeat 3-4 times). Provide towels for the wet kids. Water Limbo: Similar to limbo dancing, but in the water. Use a rope instead of a stick. And let the kids swim under the rope. This game is not for small kids. Water Guns Battle: Let the kids play around, this game is lots of fun. Luau Treasure Hunt: Treasure hunt in the sand. Hide small Luau related toys in the sand, give each child a bucket & shovel, the kid who finds the most toys wins the game. I hope our Luau Party games will help you in your planning and I hope your kid will enjoy the games. If you have great Luau Party games, don't forget to Party It Forward. Share your ideas with us! We and others will love to hear from you. It's nice when parents contribute in helping other parents like you, to find Free Luau Party games.